Tyrannosaurus Rex is among dinosaurs on display in Neopark in Nago. The monstrous Tyrannosaurus has landed in Okinawa, and everyone who wants to see it, along with other life-size replicas of dinosaurs, can make the trek to Neo Park Dino Kingdom any day through February 11th. The Neo Park Dino Kingdom at 460-7-41 Nago, Nago City, is open daily 9 a.m. ~ 5:30 –p.m. Admission is ¥1,500 for adults, high school and junior high school students, and ¥1,000 for kids 3~12 years of age. Many dinosaurs are on display during the period, including the triceratops and others. The life-size replicas of the ancient reptiles have animation mechanisms that make them move for a more life-like effect. 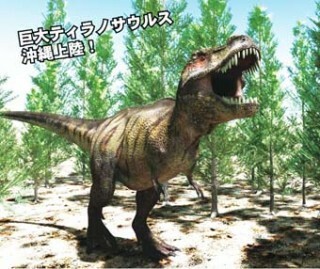 There will also be a 3D dinosaur movie playing, to actually experience dinosaurs as if they have come to life.